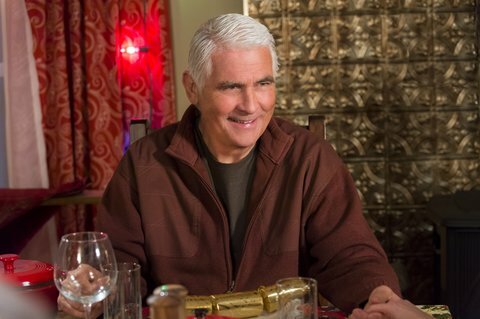 James Brolin has been a star of TV and film since the ’60s, rarely disappearing from either for very long before popping back up somewhere or other, and tonight at 9 PM he can be found starring in “Christmas with Tucker,” the debut original movie from the Hallmark Movie Channel (which, just in case you aren’t aware, is a separate entity from the Hallmark Channel), playing a gruff but loveable grandfatherly type fella who gets to have a lot of scenes with a very cute dog. I was fortunate enough to chat with Brolin for a bit when he attended this summer’s Television Critics Association press tour in Beverly Hills, and – as you’ll read below – I was even more fortunate to be able to continue the conversation a bit later. Bullz-Eye: So you’re in a dog movie, but are you a dog guy by nature? James Brolin: Yeah, but guess what? I don’t have a dog right now. But I’m kind of shopping! The thing is, I’m not sure where I’m going to be next, and I kind of hate to go off and leave a dog once I have it. I’ve found that didn’t work well in the past. But I got my wife a dog. And the dog is… I can’t believe she’s had it 10 years now. And it sleeps right here. [Points to his head.] It likes the top of the couch or the head pillow. So usually, if you roll over it or around it, it gets out of your way and just goes down to the other end. Anyway, I’ve been moved to the back seat of the car now. [Laughs.] Those two run things. BE: Yeah, we just got a dog a few months ago, so I know what you mean. BE: How was this dog, Tucker, to work with? JB: Fine! Really good natured. He would do all the things, and then when you’d go to shoot, sometimes the dog would have a little brain fade or confusion, but it’s not unusual. You just keep going. You have the trainer keep going, you run the camera, and now with digital, you can just turn the camera on and let it run for two hours, and then you go in there, wade through it, and pick out just what you need. But that’s Filmmaking 101, in a way. If you have time for that, you do that. And if you’re doing a dog picture, you make time. And the kids… Anyone youthful who was involved was just right on. Gage (Munroe) is just like a honed pro, so that wasn’t an issue. Kids weren’t an issue. But animals are always an issue, and you just need to schedule the time to shoot and shoot and shoot a little bit.